BEC5 Curaderm is globally recognised for its efficiency in the treatment of the basal cell carcimonas (BCC) that constitute skin cancer. Non-melanoma skin cancers are the most widespread variety of skin cancer and BEC5 Curaderm, with its special formula derived from the purified plant extract, is effective in bringing about their regression. Approximately 77% of non-malignant forms of skin cancer take the shape of basal cell carcinomas (you can learn more about basal cell carcinomas here), but recent developments have found them to be entirely treatable. The number of people who have chosen BEC5 Curaderm cream in their bid to find efficient treatment for skin cancer is in excess of 100,000 and it is growing all the time. The popularity of the treatment can be put down to its convenient and non-invasive properties. BEC5 Curaderm cream is capable of eating away at cancerous cells - a property that comes from the solasodine glycosides extract itself taken from the Devil's Apple plant (Solanum Sodomaeum) from which it is made. The cream can be applied easily and conveniently to BCCs in the manner of any topical treatment. It causes no damage to healthy skin cells and leaves no scarring. In order to gain a deeper insight into the role of the Curaderm cream's origins in the Devil's Apple and the research of Dr. Bill Cham - the man behind its practical application in the fight against cancer - read more here. 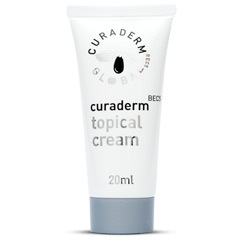 How does Curaderm-BEC5 20ml cream work? The active ingredient of BEC5 Curaderm cream is solasodine glycosides. This ingredient is found naturally in the Devil's Apple and also in the aubergine, though in lesser quantities. The ingredient comes from rhamnose, a deoxy plant sugar that occurs completely naturally. Now, the cancer cells in BCC are known to have lectins that bind to sugars in their plasma membranes, which are not present in normal healthy cells. This means that BEC5 Curaderm cream is capable of binding with the cancerous cells exclusively at which point it delivers its second active ingredient - a cancer cell destroying glycoalkaloid. The application of the Curaderm-BEC 5 cream itself is very simple and this makes it suitable for all manner of non-melanoma skin cancers. It is believed to have potential in the treatment of malignant skin cancers too. Of course, BEC 5 Curaderm topical cream has been tested thoroughly in clinical trials. Research has found that it shows considerable success alongside minimal associated side-effects. From its very first development by the esteemed Dr. Bill Cham, a great deal of research has been undertaken to support the safety and efficiency of BEC5. You can read more about the Royal London Hospital's landmark study here. Prior to the development of Curaderm-BEC5 20ml cream, patients with basal cell carcinomas were compelled to pursue surgical treatment, radiography and other dermatological techniques with a series of possible side-effects, including scarring, changes in the character of the skin and additional invasive surgery. Now they have an alternative. The traditional methods of treatment can be read about in greater detail here. What makes BEC5 Curaderm a good investment? The most attractive property of BEC Curaderm treatment is that it removes all traces of BCC in the majority of cases. It offers a long term solution with side-effects that are usually no worse than a redness of the affected area that is quick to fade. Click here to order your course of Curaderm cream. Not all forms of skin cancer are the same. In order to treat non-melanoma skin cancers such as SCC (squamous cell carcinoma) and BCC (basal cell carcinoma), various traditional methods are used, from surgery to chemotherapy and radiotherapy. BEC5 Curaderm skin cancer treatment is a non-surgical, non-invasive choice. This form of skin cancer treatment represents an attractive option because it treats non-melanoma skin cancers in the visible top layers of the skin tissue in a gentle and effectual manner leaving no sign of cosmetic damage. Those parts of the body that are most frequently exposed to the sun (hands, neck, face, etc.) are the most likely to suffer from SCC and BCC because their appearance is causally linked to how the body responds to sunlight. Keratosis often signals the likely development of SCC and has is often diagnosed by examining hard and scaly patches of skin. Fortunately, BEC5 has also been used to treat keratosis in order to prevent lesions from progressing.